I purchased a “build it yourself” cabinet over the internet, naively thinking that it couldn’t be too complicated if they really expected me to assemble it. Boy, was I wrong. I don’t know what a shoulder is. When is a hole parallel to a groove? Is it when the hole is facing the groove making them both “face” the same way, or when it is going along in the same direction as the groove? In retrospect this seems more obvious than it did at the time. Next, I’ve posted before how “bugs” are different than human factors issues. I would like to add that minor errors in the instructions for a very complex spatial task can make it nearly impossible. For example, the instructions end with “To understand how the bastion fastening system works see next page.” I finally did find that explanation two pages previous to the current page, at which point I’d forgotten what I was looking for. Last, hardware is referred to by size and a number. For example, a diagram would have a picture of a screw going into a board and have the callout “1 1/4 #8.” Because there are multiple screws included that are 1 1/4″ long, I needed to reference the second page of instructions that listed all the hardware. On the hardware page are pictures and diagrams of the tops and side views of the hardware with the label below. Unfortunately, the label is equidistant from the diagram above it and below it, so I had to keep reminding myself by looking at the top screw picture to see if the label was for the graphic above or below. On this list the name is followed by a number in ( ), which seemed to be the number included in the package. So, back to my search for the 1 1/4 #8, it turns out there are two different 1 1/4″ screws, two different Phillips Flat Head #8s, and one of those happened to have (8) in the package. At this point the conjunction search became too much for me and I had to take a break. On returning, I decided to ignore the front of the instructions that told me “Assembly is very easy if you read and follow the instructions step by step.” Once I just started putting it together using the overall picture and clamps and screws from my own workshop it went much faster. I had a few instances where I needed to backtrack, but overall it a successful assembly. Was this the triumph of a good mental model over step by step instruction or do I just lack the mental resources to follow steps that depend on referencing other steps and pages? I suppose I should also mention what was well done in the instructions. The pictures of each screw with the difficult labels included: 1) a top and side view 2) a box drawn to scale (so you didn’t need a ruler to measure if the screw you were holding was 1 1/4″). The instructions also divided the steps into small enough independent pieces on each page that they were not overwhelming. Good job on that! 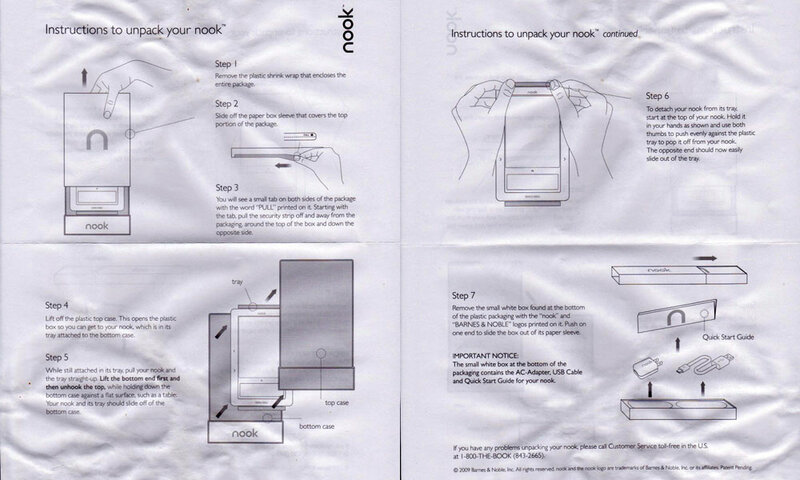 In other words, the Nook packaging actually necessitates these lengthy instructions, as ridiculous as they are in their own right. Somehow, Barnes & Noble invented a box that’s every bit as complicated as their product. Once the sleeve comes off, you are presented with what amounts to a clear acrylic puzzle box: pull of the plastic seal, pop the two parts of the box apart, and then release the nook from the death grip of the clear plastic holster it’s cradled in. I’ll admit, I was getting a little frustrated during the unwrapping, and I couldn’t help but be thankful I wasn’t filming it. Compared to the easy paper zip-cord on the Kindle’s packaging, unboxing the nook would be embarrassing to do live — especially for someone as klutzy as me.